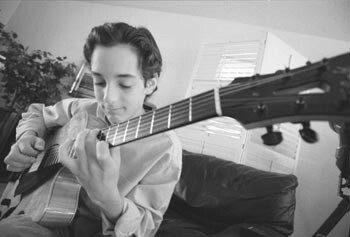 Youth brigade: Twelve-year-old Santa Rosa jazz guitarist Julian Lage improvises with the skill and grace of a seasoned performer. He performs Oct. 29 at the San Francisco Jazz Festival. SOME SAY soul takes time--that you have to pay your dues to play the blues. But maybe soul has nothing to do with time. Maybe it resides in a place beyond age and reason. Julian Lage of Santa Rosa began playing guitar when he was 5 years old. Now 12, he has already recorded with David Grisman, played in front of a international audience at the 2000 Grammy Awards telecast, and had an Academy Award-nominated documentary made about his precocious talents. "I really wanted to start playing when I was 4," Julian says as he sits on a leather chair in his family home. His handmade Manzer guitar seems like part of his body as he accents his words with gentle and serene jazz riffs. There is nothing flashy or contrived about his efforts--they're easy and smooth. "I saw my father playing the guitar, and I wanted to join him," he continues. "But my mom and dad made me wait until I was 5." His parents, Mario and Susan Lage, both felt that Julian's desire to take up the instrument at such a young age might be a passing fancy. "We thought there might be physical constraints," Mario explains. "Perhaps Julian's hands wouldn't be large enough. When I first took him to a music store, and showed him some small guitars, he didn't like them. He said their tone wasn't right. That tipped me off that maybe he had an ear." Within a year of getting his first guitar Julian was already playing in front of audiences. His father often took him to music stores, where he would jam with other musicians. "As a parent it's difficult to judge your child's talent," Mario says. "But I was immediately impressed with Julian's work ethic. He'd practice five or six hours a day. Teachers would ask us if we were forcing him to practice. We told them, 'We have to force him to stop.' "
Julian--who performs Oct. 29 at the San Francisco Jazz Festival--accepts his talent with little fanfare. He's been playing the guitar for almost as far back as he can remember, and the act seems like a natural extension of his personality. "If I have a gift, it's the chance to make music and play with other musicians," Julian says. "I never really think about why it comes so easy. To me it has never been about technique. It's more about the feeling I get from the music. I'm just trying to be the best musically that I can be." Although Julian's musical interests began with the blues, his current passion is jazz. His influences include pianist Bill Evans, saxophonist Sonny Rollins, and guitarist Pat Metheny but also embrace people like the late jazz violinist Stephan Grapelli and Indian sitar player Ravi Shankar. "I think as you play you eventually discover a spiritual element in the music," Julian says. "I meditate, and I find that this centers me and allows things to happen. You can't force the music. You can't force yourself into a groove." Nevertheless, Julian seems able to fall under the spell of his own music almost at will. Watching him play up-close is a transforming experience. There's no awkwardness or hesitation. His fingers dance along the frets as if guided by some hidden force. He clearly loves playing and says he wasn't intimidated performing at the Grammy Awards. "I really enjoyed the experience," Julian says. "I wasn't nervous. I knew what I was there to do. It wasn't like they were asking me to play the saxophone. I was there to play the guitar. It was very simple." Julian improvises with the grace of a seasoned performer. His ability to go beyond merely cloning the licks of older musicians has gained him respect and afforded him the opportunity to jam with the likes of Carlos Santana. "If you take a song like 'Autumn Leaves,' " Julian says, "and start improvising on a solo, what makes it interesting is the contrasts you create with the song's basic form. You have fun with it." Because of a demanding rehearsal and appearance schedule, Julian has a home tutor provided by Santa Rosa's Mark West Springs School District. He also studies music with Sonoma State University instructor Randy Vincent (with whom he'll be performing at the S.F. Jazz Fesiival). Although Julian plays a number of different instruments, including an Indian drum called a tabla, his primary focus remains the guitar. "I went to the dentist and they had this form to fill out," Julian says with a smile and a riff. "They wanted to know if I played any instruments. I just filled in everything I'd ever touched until I ran out of space on the form." From the October 26-November 1, 2000 issue of the Northern California Bohemian.